A quick rundown of the various way to get to the island. There isn’t an answer to the often asked question: “What’s the best way to get to Koh Chang?” as that depends on what type of traveller you are. For some the quickest is the best. For some, it’s the cheapest option. Choose the method that suits your style of travelling the best. 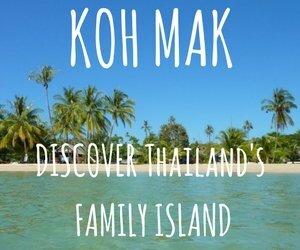 With three daily flights from Bangkok’s Suvarnabhumi Airport, getting to Koh Chang has never been easier. Flights depart at 08.30, 11.40 and 17.05 and take exactly 1 hour. Bangkok Airways operate the flights and tickets can be booked via their website. 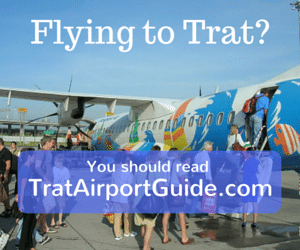 The daily flights land at Trat airport, which is located on the mainland and around 30 minutes from the ferry terminals. After disembarking at Trat airport you can hop on a minibus and get a direct transfer to your accommodation on Koh Chang. Expect to pay 500 Baht, which will also include your ferry crossing or 900 Baht for a return ticket. The ferry and flight schedules are designed to coincide with each other. You can catch the last flight, PG307, leaving from Bangkok at 17.00 and have time to make the last ferry crossing to Koh Chang. This also works the opposite way, you can leave the island early enough to catch the first flight of the day back to Bangkok. Bangkok Airways run a minibus service for their passengers. This ensures that passengers are guaranteed to get to Koh Chang easily. And have no stress worrying about getting to the airport in time for their return flight. Minibus tickets can be bought at Trat Airport or in advance online – which will save you money. Another popular option to arrive on Koh Chang is by private transfer by car or minivan. This is a great way to travel especially in the high season as the price of flights can increase up to around 3,500 Baht per person. Bookings can be made online with several companies vying for your business ( including ourselves who have been arranging transfers for over 10 years. ) , where you can arrange to be picked up from your hotel or a pre-arranged meeting point, at either Bangkok Airport. Prices vary depending on the amount of passengers and type of vehicle. There is also an option to catch a shared minibus from Bangkok’s Suvarnabhumi airport. Unfortunately tickets for the shared minibus can’t be booked in advance but can be bought after you land from the Suvarnabhumi Burupha ticket counter from the main terminal building on level 1. Tickets cost 600 Baht including the ferry ticket for one way. Shared minivans also run between hotels in central Bangkok and hotels on Koh Chang. Tickets can be arranged in advance online or through your hotel or tour operators in Bangkok. 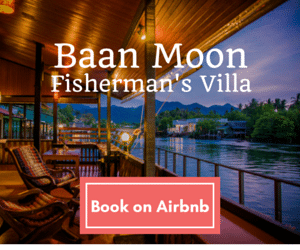 Expect to pay between 900 – 1,100 Baht per person including a ferry ticket. 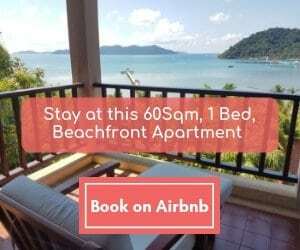 The price depends on your destination on koh Chang. Beaches to the south of the island will be more expensive than those at the north, near the ferry pier. The shared minibuses also don’t drop off at hotels on the east coast of the island. If you’re leaving from Bangkok, the cheapest and most economical way to get to Koh Chang (via Laem Ngop) is by bus. There are a few different options you can take regarding buses and times. The best and most popular way is to catch the #999 bus from Ekamai (Eastern) Bus Terminal to the two piers at Laem Ngop, where you can then proceed to catch the ferry over to Koh Chang. The times for departure are 07.45 & 09.45 everyday and the journey takes between 5 – 6 hours, depending on traffic. The cost is around 260 Baht for one way. If you find the #999 buses depart to early, you can catch the #9908 bus from Ekamai Bus Terminal and also the Northern Bus Terminal (Moh Chit). This again takes approx 5 hours to arrive in Trat town and will cost you 260 Baht. Once in Trat you can catch a songthaew to the piers at Laem Ngop, this journey takes around 30 minutes and costs 60 Baht per person. Another two options is the Cherdchai Private Bus Company night bus which is a first class, air conditioned bus that leaves Ekamai Bus Terminal at 23.30 and arrives at 05.00 the following morning in Trat town. Finally, there is the VIP buses which runs from Khao San Road, this departs at 08.00 and arrives at the Centerpoint pier in Laem Ngop at 15.30. The price, which includes the ferry ticket is 450 Baht per person. More expensive than the government bus and aimed solely at people staying around the Khao San Road area. If you’re arriving at Bangkok’s Suvarnabhumi airport and don’t want to pay for a private transfer, then you have a choice of two services for travelling to Koh Chang. The first is the ‘Lonely Beach Express’ officially known as the Koh Chang Suvarnabhumi Burapha Bus. This service takes you all the way to Lonely beach (hence the name) on the West cost of Koh Chang and will stop at any resort along the way, before it reaches its final destination. There are 3 daily departures, at 07.50, 11.00 & 14.00. If you catch the last bus at 14.00 you will still make it in time to catch the last ferry sailing of the day over to Koh Chang. The price is 600 Baht, including the ferry ticket and can be caught on the ground floor of the airport terminal building. The booking desk for this service can be found at Entrance 8 on Level 1 of the terminal building. The second option are the Government buses. These travel directly to the piers at Laem Ngop and depart from the airport bus station. There are two daily departures, but only in the morning. The times of departure are 08.20 & 10.20. The cost is around 250 Baht. To get to the airport bus station you have to catch a shuttle bus, from Entrance 5 on Level 1. Koh Chang can be reached from Koh Samet and Pattaya via private transfer or minibus, in one day. All tour agents sell tickets for the shared minibus services. Figure on 600 – 800 Baht / person. Avoid the public buses as they are much slower and involve changing vehicles a couple of times or more en-route. It is also possible to get to Koh Chang from the three Cambodian border crossings at Poipet, Ban Pakard (Pailin ) and Koh Kong. From these three places you can catch either a bus or pick up truck taxi to Trat ( via Chanthaburi if you’re coming from Poipet or Ban Pakard ) Chantaburi. Then a songthaew to the piers at Laem Ngop. You will find two ferry terminals on the mainland at Laem Ngop, everyone will end up at either one or the other and both take vehicles and passengers. Ao Thammachat pier is used by Ferry Koh Chang, the ferry sails between the hours of 06.30 – 19.00 and runs every 45 minutes. You will arrive at Ao Sapporot pier on Koh Chang, and the charge is 80 Baht for passengers and 120 Baht for cars one way. This is the better of the two ferry piers. The second pier is Centerpoint pier and is used by the Centerpoint Ferry company which allows cars on free of charge and passengers pay 80 Baht. The ferry runs each hour between 06.30 – 19.00 and arrives at Dan Kao pier on Koh Chang. Be aware as this pier is not as close as Ao Sapporot pier to the West coast resorts. They also have a longer crossing time and fewer sailings. So this pier isn’t as popular for visitors coming to the island. However, some of the cheaper minibus services use this as they get discounted tickets. There aren’t any passenger only boats or speedboat services from the mainland to Koh Chang.